Anna was fantastic. She knows her city well and she is very knowledgeable. We enjoyed very much the tour and we highly recommend her! We loved Anna! This was our second tour with Anna in as many days and it was as good as the first. Anna is exuberant and will make sure you do and see what you want and you will not be disappointed. We learned so much about Singapore in our time with her. Thank you Ana! When we come back to Singapore, we will certainly tour with her again. We loved Anna! Communicating with her was a breeze and she gave us loads of information about Singapore in advance of our arrival. Anna is very enthusiastic and knowledgeable and we learned a lot about the beautiful city of Singapore. From beginning to end, Anna made the most of our time together and we loved every minute with her. Thank you Anna! Ana is incredible! She was prompt to pick us up and the van was very comfortable for our family of five. We were happy to have an air-conditioned van as we hopped in and out to our destinations since it was so hot. Ana was great with our 3 kids and made sure they had a good understanding of all that we were seeing. She was also flexible in accommodating our requests to see different areas we hadn't already covered. Her English is excellent too! I would highly recommend Ana to anyone visiting Singapore! If are you looking for someone to show the highlights of Singapore at night, look no further than Anna. She does a great job and can tailor your tour based on your interest. Highly recommended. Anna was very enthusiastic she was able to turn on a dime when we were in Chinatown and we weren't that interested and my husband casually mentioned that we would love to see where people live she got us on the subway and out to the Housing Authority for a fabulous tour. we were very happy with her services !!!!!!! Anna is a superb guide and, coupled with our own driver who took care of not only us but also our luggage, she provided us with a perfect all-day, individualized tour of Singapore. We had spent time in Singapore before, and she was able to "fill in" our knowledge with some special experiences and new sites in this constantly changing island! She even tracked down a book I wanted to buy for me. Very special day, and very special woman! Anna did a great job showing us around Singapore! She is very knowledgeable and informative with interesting insights and facts about the culture and history of Singapore. She was also very flexible and accommodating to plan and change the itinerary as we suggested. We saw a LOT in our very full day with her. We really enjoyed our time with Anna and will definitely recommend her to others we know who visit Singapore— and we would hire her again! Ana was a wonderful tour guide. She went above and beyond to ensure that we enjoyed our day. She was pleasant,entertaining and more than helpful. I highly recommend her to anyone looking for a guide. Anna is fantastic. I actually hired her for a tour a couple years ago on my first trip to Singapore, and when I was going back with my parents (their first trip to Singapore) I knew that I needed to see if she was available. She is so thoughtful, and flexible, and absolutely puts the tourists' needs first. If you are going to Singapore, hire Anna. She knows everything and will absolutely put together the tour you want. The absolute best guide I've ever had. Anna did an outstanding tour for our group. She is very detailed in her presentation of Singapore's history up to current times, and thoroughly researched any questions we had. Pleasant personality, easy to understand and converse with. We adapted the tour a bit to our liking and she was very flexible to our requests. Great job! Anna was fantastic, she is very enthusiastic about Singapore and it shows in her professionalism and knowledge. Had a wonderful day seeing sites and visiting areas we probably wouldn't have seen without Anna to show us and give us the insiders knowledge about Singapore, Thank you Anna. Anna was an amazing and perfect guide with an excellent knowledge about Singapore & its history which helped us to understand why this town is so special. We were lucky to enjoy her private tour already twice this year. We thoroughly enjoyed our tour of Singapore with Anna. She catered so well for us as a family of 4 (incl. 2 teenagers) and was interesting, informative, entertaining and engaging. Anna loves her country and was able to give us a deep insight into it's history, culture and food. We learnt so much form her but most of all, had great fun on the day. We highly recommend Anna. We are so pleased with the 2 days we spent in Singapore with Anna O. Anna contacted us prior to our arrival and asked about our interests, Anna put together an itinerary that seamlessly covered all of the things we wanted to see in Singapore. We never could have done this ourselves with a guide book. Anna was an expert on all things about Singapore, spoke perfect english and was very personable. If you are planning a trip to Singapore and want to hire a guide make sure you ask for Anna. Anna was great! I really enjoyed my tour. I was able to see far more, than would have been possible, if I had toured on my own. She customized the tour according to my interests. I would highly recommend hiring her. 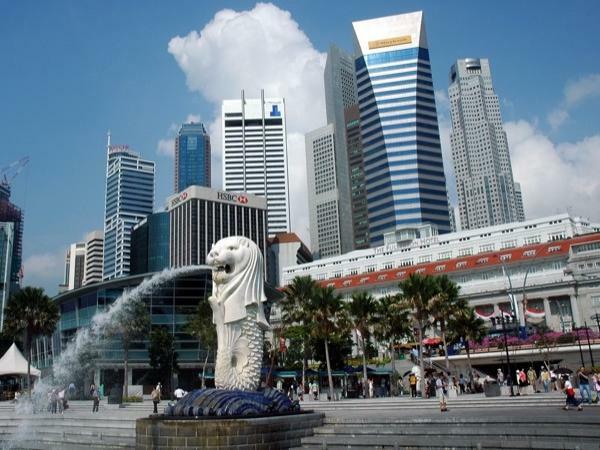 Anna is extremely professional and shows that she is very proud of her city Singapore. Anna showed us an amazing time with local knowledge and great food treats along the way. No question went unanswered. Thank you very much for an enjoyable night and will hopefully see you again. Anna is a fantastic tour guide! She is extremely knowledgeable of Singapore architecture and history. As a proud Singaporean, her passion for sharing the knowledge of this great country has made her tour so much more enjoyable! Anna truly customize her tours based on your interests. She will send you a questionnaire to understand you and what you would like to see, and then she will come up with a schedule to accommodate your needs. I am happy to report that the 2 day tour she guided us was perfect! We had a wonderful tour with Anna. Singapore is an interesting and diverse city. We really enjoyed the one on one attention we got and her insight on this amazing city. Unsere zweite Tour mit Anna und wieder absolut spitze! Diesmal konnten wir zwei volle Tage mit ihr verbringen und haben so viel über Land, Leute und Kultur von ihr erfahren. Niemals hätten wir dies auf eigene Faust alles erlebt. Jede Menge typisches Essen in verschiedenen Hawker-Centern und die Fahrten mit öffentlichen Verkehrsmitteln waren perfekt organisiert. Anna weiß, was sie tut und sie macht es wundervoll! Vielen,vielen Dank. Anna is most knowledgable and gives an extremely comprehensive tour tailored just for us including discussions about history and culture to better understand the Singaoore of today, as well as covering the major sight, markets and food. When the rains came down, Anna was able to substitute another venue to complete the tour. We had contact with Anna before arrival discussing our wish list. Her itinerary hit every mark. From greeting us at the airport to delivering us to our apartment, the pace of our tour was perfect. She was of great assistance handling a small crisis for us. I cannot say enough about my guide, Anna. She was very friendly, knowledgeable and made my stay and tour of Singapore memorable,,,,,so much so that I am planning to return,,book her again,,,and see even more of this fabulous city! Just a wonderful experience ! Anna is a wonderful guide. She is fun, enthusiastic and very knowledgeable. She showed us several things in Singapore that were beyond what one might expect and added to our appreciation of this country. Her English is excellent and we thoroughly enjoyed our day with her. Anna O did a marvelous job of showing us Singapore within a limited time frame. Her passion and knowledge about her home country was a pleasure to behold. Anna did everything possible to make our tour easy and remarkable and we shall always remember her kindness and consideration. We learned so much in a short time about Singapore that we will never forget, all thanks to Anna! Anna was an absolutely delightful guide! She was so enthusiastic about showing my husband and me around Singapore. We planned our day and a half tour in advance. She offered us various choices, including a private cooking class with options as to the type of food and even menus options. We had a great time sampling the different areas of Singapore as well as the different cuisines. I can't imagine anyone better to guide you around Singapore! Anna was very friendly, informative and knowledgeable. We had a great time and she took special attention to showing us not only the main sights of Singapore, but also many local spots that were really interesting. She was great! Because of Anna, we got to enjoy Singapore by night!! Loved the light show at the top of The Marina Bay Sands Hotel. Especially loved the light and sound show at the Gardens By the Bay. To see Chinatown at night all lit up and decorated for the Chinese New Year was very special. We highly recommend Anna for your tours in Singapore. Anna allowed us to enjoy Singapore during our stay by customizing our tour to incorporate all the areas we were interested in. We especially enjoyed The Gardens by the Bay. They were magnificent. Anna is fluent in English, very knowledgeable in Singapore past and present. She was on time and accompanied by a very excellent driver, Ricky. I highly recommend her to tourists visiting Singapore. Anna was an amazing and perfect guide with an excellent knowledge of Singapore. This is an excellent, interesting and informative tour with a delightful and charming guide. We enjoyed every minute. Highly recommended. Anna was amazing. Tour of Singapore in a day only Anna can. We were very pleased she took us to the places were locals go. Had fantastic time with her. Very fluent in English. We had a personal, customized, five hour tour with Anna. She is one of the best TBL guides we have ever had. Her comprehensive, in-depth knowledge of Singaporean history, politics and daily life come from her authentic experiences. Her language skills are superb, her personality is delightful, and she could not do enough for us. Highly satisfied with this tour and would highly recommend Anna for any visitor wanting a comprehensive overview of Singapore. Anna was a great tour guide and we really enjoyed experiencing Singapore with her help. Having Anna accompany us to these sights allowed a deeper look into each part of the city. She is enthusiastic, client-focused, down-to-earth and a wonderful representative for the fascinating city of Singapore. We really enjoyed Anna and our time in Singapore. I would highly recommend her. Excellent tour. Anna was extremely knowledgeable about every site we saw. We got a great overview of the city and saw a lot in a short time. Would highly recommend her to anyone. Anna was amazing.I was a solo traveler with limited time to sight see. We packed in so much and Anna was so knowledgeable.Definitely recommended. Our guide was fantastic. From showings how to use the subway, telling history and taking us to local places to eat and drink. We would never have found these places by ourselves. Well worth booking. Will certainly book Anna again and recommend her to ours friends travelling to Singapore. What a terrific guide Anna was today. Answered all our questions, was flexible in terms of what we did/didn't want to see, allowed for plenty of stops when we wanted them and was clearly very knowledgeable about the whole area of Little India as well as Singapore as a whole, of course. Great tour by Anna. If there is something she doesn't know about Singapore then I certainly did not find it. Nice person to travel around with, speaks perfect English, and she had the whole day organized. Highly recommended. Ana was fantastic, extremely knowledgeable, very warm and well versed all the way around; Iam handicapped and she was very sensitive to our special needs.. We look forward to returning to Singapore and spending more time with this unique lady. We highly recommend her. wonderful bespoke tour for our family, full of local insight, very knowledgeable, insightful about matters about local culture. More than just sightseeing. Very accommodating and caring of her group's individual needs. A bundle of energy. Truly a proud Singaporean. Everything was perfect, Anna was incredible I would highly recommend her. TOUR GUIDE RESPONSE: Hi Merdene, I am sorry to hear how you felt about the temperature inside the car. 1.Aircon blower at the back was shut off promptly, when you mentioned cold. 2.I asked, but you did not said you unwind window due to cold, and so driver winded window up & down, in order to clear the rain droplets on your window. Please accept my apology for being too engrossed in our conversation, that I had over looked, you may still feel cold even when you had your jacket on! Anna was an amazing tour guide! Very knowledgable and enthusiastic about Singapore. I only had one day in the city and she really helped me make the most of it. Anna was absolutely terrific. She is warm, funny, flexible, and really knows her Singapore history. We asked her to show us how to get around on public transportation and show us sights we wouldn't get much out of seeing on our own. She did just that and offered us the opportunity to dine with either an Indian or Filipino family. We chose Indian and they were lovely people with a delicious dinner to share. Best yet, Anna spent 12 hours with us, including dinner. An excellent value and new friends. Anna was simply wonderful! In love with her city/country and willing to share its history and geography, Anna showed us all aspects of Singapore. Thanks to her excellent approach and knowledge, we will be back! We feel very fortunate to have Anna as our guide. The tour was perfect!!! I really liked that Ana emailed me again before our tour to confirm the details of the tour. She met us at the cruise terminal. We used subways to explore many varied areas of Singapore. We ate at local restaurants. She gave us great insight in how to use their public transportation. Ana helped us by letting us know what we could see by ourselves that night and the next day that we were going to be in Singapore. Ana was very informed and I would highly recommend her. Anna was great! She had amazing insight to what makes Singapore such an amazing city. Cant wait to go back and will defiantly re-book with Anna to check out more of the city!! Our Singapore tour by Anna Ong was OUTSTANDING. We have had private tour guides around the world but none has ever been as good as Anna. She was early and worked tirelessly for us--if there was something we did not want to do, she was creative with a work around and if there was something we liked she built upon it. She inquired about dinner with a local family and we loved it--she is enthusiastic about Singapore and we loved every moment with her. She is the consummate professional! Anna was friendly, informative and was amazing to have as a guide. The tour was lead by us in how long we wished to stay at our places chosen and guided by her knowledge and experience which we highly valued. Would highly recommend her as a guide. Best ever-competent. Conscientious, knowledgeable, energetic, enthUsiastic, over and above! I spent a wonderful day touring Singapore with Anna of Tours by Locals. After several email exchanges prior to my trip, Anna was able to craft a day of sightseeing to suit my tastes. She is very passionate about her city and extremely knowledgeable about the city's history and culture. Highlights - hawker center, Chinese tea making, calligraphy - and lots of history! She even made other reservations for me. I highly recommend Anna! We had real concern about spending 4 days with a guide we never met. We had the BEST time with Anna, During are emails she kept saying it was our trip and it was. Did everything we wanted to do. When we had questions about the "housing neighborhoods"in Singapore she took us there so that we could see how the work. We visited the shopping center associated with the center,my husband had a hair cut,my, we visited a bakery "yum", ate at restaurant. She went out of her way to organize our time free time. Anna was amazing while taking us through Singapore. She explored the city not only for the tourist spots, but into the heart and soul of the cities citizens and life style. We experienced local food favorites as well. Wonderful day with Anna!! 10 stars!!! Couldn't ask for a better tour guide. We had hard rain most of the day, yet Anna did a wonderful job showing us Singapore. We will definitely be return customers and highly recommend Anna! She met us at our hotel with a car and driver and spent the day with us as she brought to life all of the wonderful sites with her knowledge and personality. There was so much to see, but she kept a comfortable pace and adjusted our day to suit those things we thought most important. We had a wonderful lunch at a local restaurant. We would highly recommend her to anybody needing a guide in Singapore. It would be hard to find anyone better or more knowledgeable after the tour she joined us for dinner. Anna Ong was a perfect tour guide during our stay in Singapore. She is a very nice, friendly and helpful person with an enormous knowledge and the time we spend with her was completely satisfying. Outstanding! Very knowledgeable, excellent English, outgoing and fun personality. Could not be better. My wife and I spent a fantastic day exploring with Anna. Having traveled all over the world, she is one of the best guides I have ever met. She didn't just show us Singapore, she taught us about her home. We learned how to eat at the food hawkers, what to order, what to avoid, and she encouraged us to experience the markets, temples, the Malay, Indian and Chinese neighborhoods. She was flexible, and showed us her city from a place of pride and passion. She was simply the best; I recommend her highly! Why is there not a sixth star rating? Anna would certainly qualify for one! It's obvious she loves her city and is proud to expose others to it. Such energy and enthusiasm! What she showed us in six hours only scraped the surface she warned us. Efficient use of her driver meant no wasted time as we moved from venue to venue. Her knowledge of the history, politics, religion, ethnic composition, and future of Singapore was encyclopedic. Anna, you're the best! This tour can only be described as superb. We were here on a cruise and I booked Anna with a car and driver. It really was worthwhile. Anna is just a delightful guide. Anna's local knowledge of Singapore was invaluable, she was highly informative and interesting. It rained quite heavily but thanks to Anna's local knowledge she was able to adapt the tour to suite. She showed us some fabulous sights, taking into account our particular interests. Thanks Anna for giving us a great afternoon. Designed and conducted our tour to accommodate our priorities and made excellent recommendations. Extremely knowledgable very professional. One of the top 5 tour guides in many years and countries. She really made it informative and fun. Anna really did a great job. Friendly, knowledgeable, and happy. Anna and the driver, Ricky, made it fun for us. Easily a 5 star and 10 out of 10 rating. We would not hesitate to use Annas services when we return to Singapore. The night lights and river tour was outstanding. Anna was truly a joy to be with. She made the four of us feel very comfortable at all times and was very well versed in all that we saw. One in our group walked slowly, but she managed to show us everything anyway. We would absolutely highly recommend her to anyone, anytime. Anna was very knowledgable about her home city. She was very patient and accommodating with us. We learned about the past, present and future of Singapore.Thank you Anna. An awesome experience. Anna was extremely knowledgeable and catered to our every wish. The best! We have already had several Tours by Locals.com, and again, this time, we had a very wonderful and friendly guide. Anna picked us up in our hotel in time, and she has showed us all main attractions in Singapore. She is incredibly professional, polite, and extremely knowledgable as she shared the beautiful city with us. Anna was right when she told us that a half-day tour in fact is way too short to visit Singapore. Nevertheless, she managed to give us a good overview of the city and a reason to come back! The tour was great. Anna was the best showing us singapore. She just did what we wanted to do and had a lot of patience. Highly recommended.She arranged everything since our arrival at the airport.